SPAIN’S new minister of public works, José Luis Ábalos has announced plans to scrap the tolls on three motorways when their franchises come up for renewal this and next year. The previous national government had pledged to do so, but appeared to be backtracking, and other promises relating to essential transport infrastructure and highway safety have been systematically broken, leaving local councils and residents sceptical and disillusioned. Both have been clamouring for well over 15 years for the AP-7 to become toll-free or bypasses built – as well as the tolls costing more than the petrol for the same journey, long-distance lorry drivers avoid it to cut costs, clogging up town centres all along the east coast. Running from Tarragona to Alicante with a break in the middle, the two stretches motorists have to pay to use total 378 kilometres. The northern half runs down from Reus (Tarragona province) to south of Castellón, taking in popular coastal towns such as Peñíscola, Vinaròs, Tortosa and San Carlos de la Ràpita, whilst the southern part starts at Almussafes to the south of Valencia and ends in San Vicente del Raspeig (pictured), between Benidorm and Alicante. Although over 19,000 drivers use each half of the AP-7 per year, this is a drastic reduction on a decade ago due to constant price rises. Its franchise is due to expire on New Year’s Eve in 2019, meaning the dawn of the new decade will now come with toll-free road travel along the coast of four provinces. 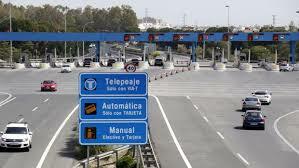 The AP-4 franchise ends on the same day, meaning no more charges from January 1, 2020 to get from Dos Hermanas, south of Sevilla to Puerto Real, near Chiclana de la Frontera in the province of Cádiz, passing through Utrera and Jerez de la Frontera. Both these are covered by the toll firm Abertis through its holding AUMAR. Earlier, the AP-1 between Burgos and Armiñón on the southern border of the Basque Country is due to expire on November 30 this year, and will not be renewed. Its 84-kilometre stretch was used daily by 19,950 drivers last year. Once these motorway stretches pass back into public hands, they will cost the central government around €37.6 million a year in maintenance, previously paid for from toll fees. But this cost is likely to be offset by reduced maintenance requirements on secondary roads, especially national highways passing through towns which bear the weight of lorries and other long-distance traffic that they are not designed for. Also, it could lead to reduced healthcare costs as residents who bear the brunt of toll-avoiding drivers are no longer affected by unsafe levels of noise and air pollution.